The 1&1 Internet is a German cloud-based domain and web hosting provider that has established itself as a leading hosting company in the top markets in the world. They serve in 11 countries including the US, UK, Canada, Italy, Austria, Spain, Poland, and Mexico. Take Officepremium Plus for 5 users only $9.99 with features including 50 GB E-mail storage and 1 TB secure online storage. Get Cloud Server XXL with features including 8 GB RAM, 160 GB storage space and 4 x 2,0 GHz vCores. Shop Cloud Server XL with 4 GB RAM memory, 120 GB storage space and 2 x 2,0 GHz vCores. Cloud L Virtual Server is very good plan with 2 GB RAM and 80 GB SSD Storage. Cloud M Virtual Server plan is with 512 MB RAM on very low prices. Virtual Server Cloud S Plan is with 30 GB SSD storage and unlimited traffic. Domain transfer is a fairly simple and quick process at 1&1 Internet. The only thing that may take time is to receive authorization from your current domain hosting company. Once you have received that, it can take 5 to 7 days for your domain to be successfully transferred. You will be guided through each step of the process to make it easy for you. Also, the transfer is essentially free and you just pay the registration fee for the term you select. Yes, you get risk free 30-day money-back guarantee on most plans at 1&1 Internet. They do not offer a free trial for their plans; instead refund your money if you are unsatisfied during this 30 days period. All you have to do is call them and cancel the plan before the 30 day deadline. Some services are nonrefundable like the domain, ranking Coach Pro, MyWebsite Services, and 1&1 Premium Service. This time allows customers to see if their plan is best for their business or not. What is the best time to look for 1&1 coupons? What can I use the coupons for? Anytime is a good time to look for 1&1 coupons as they are abundantly available. However, if you want to be the first to benefit from the new coupons the best time would be the weekend, first week of the month, and before special holidays. There are many active coupons released during the days leading to Black Friday every year. The coupons are available for virtually all the services offered at 1&1. However, the most common discount codes are available for domain and web hosting. You can also get codes for online marketing, website security (SSL), and Email. Do I have to apply the code somewhere? In most cases, you do not have to type in the code and apply it on the checkout page. The coupons are activated simply by clicking them. Once you do, you will be directed to the page of the product or service the code is for. You can go ahead and put it in the cart and proceed with the checkout. The discount will be applied automatically. 1&1 is one of the few domain and hosting companies that also offer monthly payments. However, it is important to note that most discount vouchers are applicable only to yearly cycles. At 1&1 internet, you have two options: monthly payments or yearly contract based on monthly rate. The latter is, of course, more economical and hassle-free. If you choose a yearly plan, you will be charged for the entire year upfront. You will be charged again when the term ends and the plan is renewed for another year. If you chose a monthly payment plan, you will be charged every month on the date you first signed up for the plan. There is no setup fee if you choose monthly payment structure. They have tapped into the latest technologies for hosting and have expanded into e-commerce, email, and online marketing as well. It is owned by United Internet and the 1&1 Internet Group has more than 19 million domain names under its management. With 15 million customer contracts, 1&1 Internet is an ever growing company. Their data centers are located in Europe and in Lenexa, Kansas. This allows them to give even better services to their customers in the US. 1&1 Internet is one of the very few companies that not only offer money-back guarantee but also offer payment flexibility. You can choose to pay upfront for the term or every month. They also offer some of the cheapest hosting plans you can find anywhere on the internet. You can save so much money by registering your domain here. The domains are as low as under a dollar for an entire year with discounts. You can even find New Top Level Domains (NTLD). Transferring domains to 1&1 is a simple process and you do not have to pay any extra fee to move your current domain. With vouchers, you can save on your domain plan. You can find plenty of help at 1&1 with the domain transfer process. 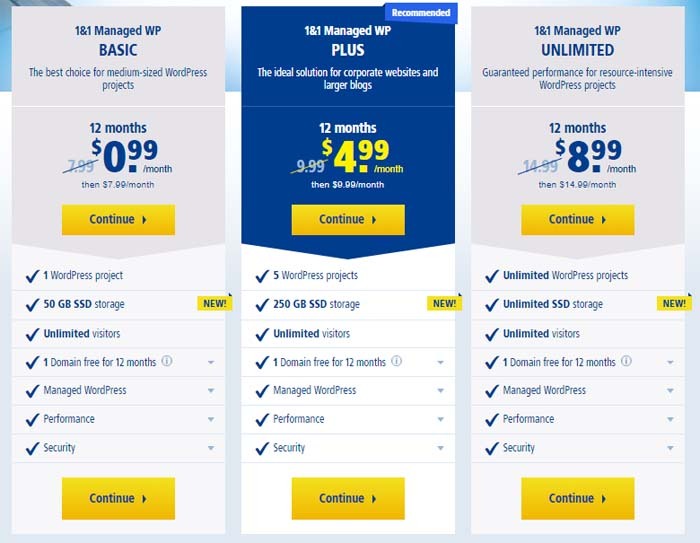 This is the cheapest website hosting plan for your business that brings you unparalleled speeds and the ability to scale up as and when your business demands. It comes with the new protocol HTTP/2. The 1&1 App Center gives you the flexibility to work with myriads of open source applications. With each of these shared hosting plans, you get 1 free domain, SSL Certificate, and 24/7 customer support. The Ultimate Pro plan also has SiteLock Basic and CDN Railgun™. The Managed Cloud Hosting at 1&1 offers businesses performance, scalability, and peace of mind about security and updates. With a managed hosting account, the work reduces at your end. You get the same performance and dedicated resources. If you want a WordPress website, it is best to go with a WordPress Hosting plan. These plans feature full SSD storage and DDoS Protection. You enjoy the very best and latest of WordPress at incredibly low rates. You can install WordPress with just one click and benefit from pre-installed plugins. Using plans optimized for WordPress allows you to grow faster and get help instantly with their expert support. The Basic plan is more suited for small to medium sized blogs and WordPress projects. The other plans are better for corporate projects with higher traffic. You get 1 free domain and unlimited visitors with all three plans. If you want to take the cloud route and need more control, the cloud server is the answer. The 1&1 Cloud Server can be chosen as Root or Managed. In the latter case, your server is managed by 1&1. You also have the liberty to choose the data center for your server. There are plenty of plan options depending on the configuration you choose. 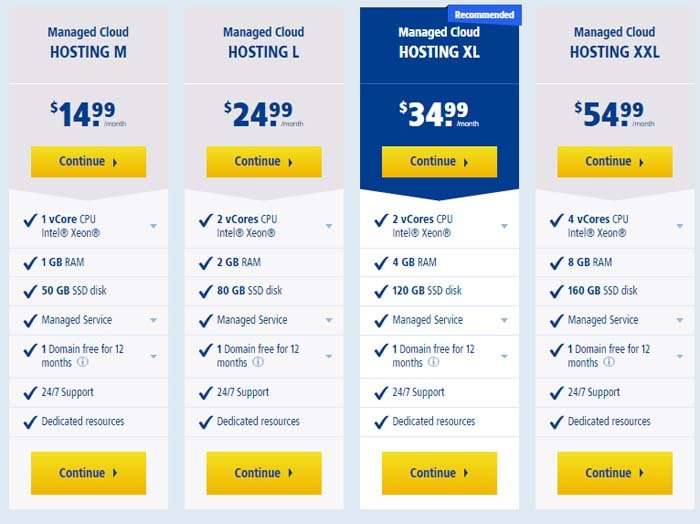 The most basic plan Cloud Server M offers 1v Core, 1 GB RAM, and 50 GB SSD Storage at $9.99 per month. The most expensive plan, the Cloud Server 5XL, costs $349.99 per month and offers 16v Cores, 48 GB RAM, and 500 GB SSD storage. The managed servers have additional charges. Their Virtual Private Server (VPS) gives you guaranteed resources and lighting fast speeds. The cloud infrastructure of this type of server offers reliability and security. It is best for those businesses that get a lot of traffic and need control of their servers. Those who want dedicated resources can opt for their Dedicated Servers that offer latest generation processors, unlimited traffic with 1 Gbit per second bandwidth, and both Windows and Linux OS. With discount codes, the dedicated server hosting plans can be very reasonable. There are six plans to suit the needs of different sizes of businesses. Besides the regular plans, there are few value plans that are literally free for the first few months. Most plans use RAID 1 or RAID 6 storage. The most basic plan Flex Special L4i starts at $59.99 per month. The biggest plan X10i gives you 10 Cores, 128 GB RAM, and 6000 GB SATA Hard disk space. 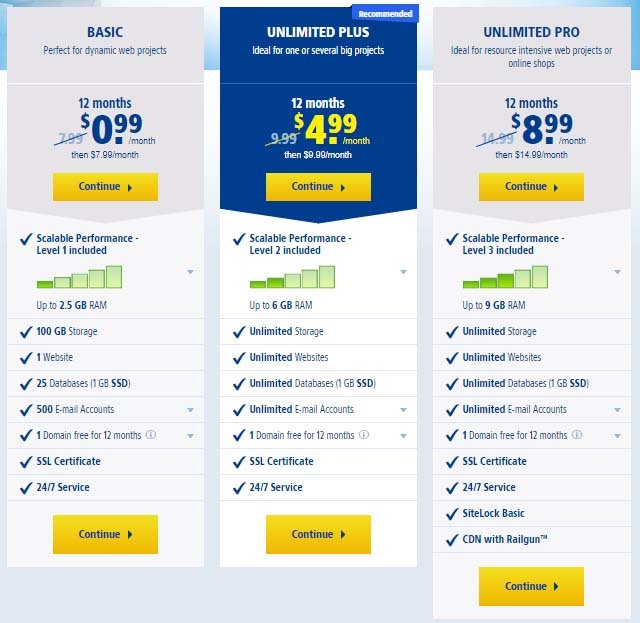 This plan costs $299.99 initially for 3 months after applying discount. Website Builder: You can build your new website in under a dollar. Their website builder plans start at $0.99 per month. They also have special plans for e-commerce websites that can help you build your online store from scratch with minimal work. Email: If you are looking for a professional email for your business, 1&1 has the best plans and cheapest rates. Again, email hosting also starts at $0.99 per month. There are three other plans besides the basic one. These are: Mail Pro, OfficeBusiness, and OfficePremium Plus. The rates vary depending on the number of users. Office Solutions: They also offer Microsoft Office 365 at very affordable rates. Office Premium and Office Premium Plus are the two options and rates vary by number of users. For 5 users, the rate is $6.99 per month for Premium and $9.99 per month for Premium Plus after discounts. SSL Certificate: One of the most important things for any website, the SSL products at 1&1 are designed for all sizes of businesses. You can get SSL with or without Wildcards. The SSL Starter plan is $29.99 per month whereas the Extended Validation SSL Premium is $199.99 per month.